If you follow my journey on the gram, you probably know by now that last week I experienced my first ever juice cleanse. I started with the small goal of just 24 hours because up until this point, I’ve never really experimented with fasting or cleansing. Ya girl loves food. I know some people out there go weeks on just juicing and that might be a goal for me one day, but I’d like to start in the shallow end, thank you! Anyways, I got looooads of questions regarding my experience from what I was eating the week before, how I felt during the process, etc. So I was excited to hop on and write about it all! Here is what I did— For the week leading up to my 24 hour juice cleanse, I detoxed my body from caffeine, added sugars & processed foods. This was to prevent my body from being shocked by the sudden lack of food intake, but also to give my body and digestive system a much-needed refresh/reset. 1- I eat A LOT out of boredom. Does anyone relate?? There were so many times throughout the day (of my actual cleanse) I found myself pacing around the house, unsure what to do with myself, and it occurred to me that these would be the times I reach for snacks. Not because of hunger, just because I can. That’s not necessarily a bad thing, considering my snacking is normally light and health-conscious, but this could become dangerous if you’re one to boredom-binge on doritos, oreos, etc. 2- The amount of processed foods out here is absurd! Since I typically maintain a pretty healthy diet, I never second guess myself when I eat a wrap for lunch or oats for breakfast. I don’t even feel guilty when I eat half a pizza on Friday night in bed with Mike, hehe. But when you’re spending the week limiting processed foods as much as possible, you start to feel like you’re in the Walking Dead. Except instead of zombies, you’re trying to escape processed foods. Insert nervous smile here. 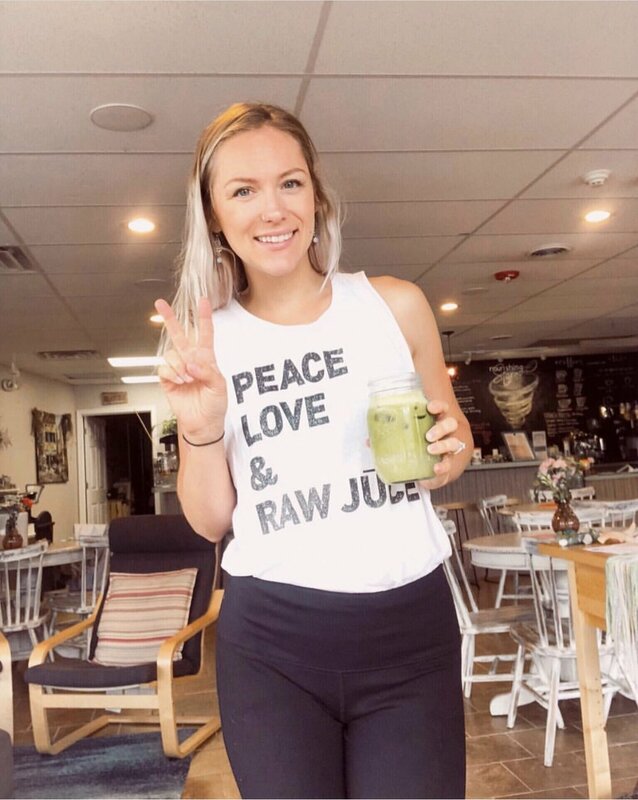 If you’re mindful enough about what you nourish your body with, I see no reason to beat yourself up over some bread… the jist- find a balance that works for your body. Pro tip- If you ARE trying to stray from processed foods, stick to the outside perimeter of the grocery store and avoid the center aisles. 3- I function a lot better without caffeine. Caffeine is a real trickster. We get so caught up in this loop of feeling sleepy and energizing with a cup of coffee that we don’t notice how haywire our brain can start getting with this much caffeine intake. When I felt the yawns coming on, I used different natural ways to energize (jumping jacks, stepping outside into some fresh air or a handful of mixed nuts), and found myself awake and able to focus more clearly than I typically do after my daily latte. My brain felt less fuzzy, if that makes sense. So overall during this week, I learned a couple things that I’ll carry forward to improve my gut-health a little more. I truly felt really good during this week! Now, onto your questions answered! These are the most popular questions I gathered through Instagram comments and DM’s. Q- Did I experience breakouts from the detox? A- I did not! When I transitioned to a vegan diet and cut out dairy, I experienced the worst break out I had since high school.. So I braced myself this time around lol. But to my pleasant surprise, my skin was happy during the whole process! Q- Did I order juices online? A- No. I know there are a couple great programs and brands out there that send juices right to your doorstep, and this is especially tempting if you, like me, don’t have a juicer at home. But I wanted the knowledge and control of everything that went into my juices. So, I bopped around the grocery store and filled my cart with wayyyyy too many veggies (definitely overshot it for 24 hours lol) and brought them to our local cafe to juice. Q- What were my juice recipes? Like I said, I doubled the recipes to fill up my bigger sized mason jars. Tip- Don’t feel like you’re stuck to a recipe! Have fun and experiment. Find your fave blends! Q- How did you store the juices? A- I used two 20 oz. mason jars. I wasn’t exactly sure how much juice I would need to last me 24 hours, but I ended up having some leftovers in each jar. When I felt hungry, I filled a smaller mason jar with ice and poured about 10 ounces of juice over the ice. A- Juices are typically best when you drink them immediately. This is when the nutrients from the fruits and veggies are the freshest and most potent. Over time, the nutrition value in the juice diminishes. That said, you’ll still benefit from your stored juices for up to 3 days in the fridge! After this, they won’t necessarily “go bad,” however they won’t nourish your body as much as a fresh juice will. Q- Did I feel tired or sluggish? A- Quite the contrary! I typically eat a pretty high-carb diet (carbs=energy), so I avoided making plans and kept my to-do list small for the day of my cleanse because I expected to feel sluggish. I was super pumped about how much of an energy boost each juice actually gave me! Q- How did I feel the day after? A- I was definitely ready to indulge in some pancakes, however I felt really revitalized. I think the cleanse did exactly what it was supposed to do- allow my digestive track the opportunity to rest and reset. Our systems work so hard for us each day, I believe it’s important we show them some love in return! Tip- Avoid pain and bloating after a cleanse by introducing solid food back into your diet nice and slooooowly. Our stomachs tend to shrink after a day with no solid food intake, so you’ll be sorry if you stuff a whole burger and plate of fries in there too soon! My overall juice cleanse experience was really good. My body is happy, my mind is clear. I’m all fresh and ready to move forward with new-found knowledge of my own system and how to treat it as nicely as possible. We gotta be grateful for and take care of these beautiful bodies that allow us to move, run, dance, play and do all the yoga! I hope this helped answer some of your questions, and if you’d like to chat more about juice recipes, tips & more don’t hesitate to send ya girl a message over on the gram!